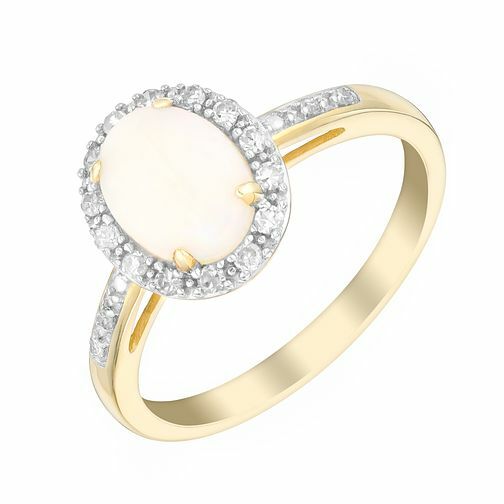 Crafted in classic 9ct yellow gold, this opulent ring is set with a stunning oval cut opal within a halo of dazzling diamonds totalling 13 points of a carat. Perfect for adding a touch of elegance to everyday, this charming piece makes a gorgeous gift. 9ct yellow gold opal & 13pt diamond ring is rated 4.6 out of 5 by 5. Rated 5 out of 5 by Anonymous from Beautiful! Truly beautiful ring, I get lots of compliments on it and the opal is just stunning. It is really eye catching and I often find myself gazing at it when the sun hits it! Would highly recommend, great alternative to a diamond ring! Rated 3 out of 5 by Anonymous from Beautiful ring BUT One of the diamonds surrounding the opal fell out within 10 days of collecting which totally put me off this otherwise beautiful ring. Customer service has been spot on from the team whilst retiring. I hope I just had a faulty ring and the others are ok.